It takes sophisticates like ourselves to fully appreciate such things ! It's funny, I just looked up at the cash register display as it was scrolling by, and there it was ! I see things like that all the time, but I bow to those of you thoughtful enough to scan them for the edification of others. I am here only to serve. you know what makes this great? 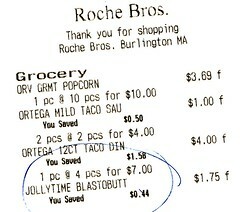 that the blastobutt was purchased at the same time as a shitload lot of mexican food.